At 78 years of age, Statistics Canada’s venerable official release bulletin lives up to its name. The Daily has never missed an issue—despite strikes, computer viruses, ice storms and a blackout in 2003 that plunged eastern North America into darkness. Throughout the decades, The Daily has kept pace with the need for consistent, accurate information and the technological changes for its delivery. In 1996, The Daily made the transition from a paper product to an Internet product. 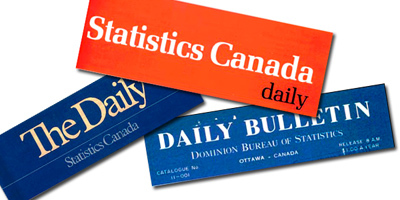 Statistics Canada continued to distribute a paper version as well until 2003 when diminishing demand for the print version no longer justified its production. This decision coincided with the 2003 blackout, which closed the Agency for six days. Despite this challenge, the publication did not skip a beat. The Daily experienced another milestone in 2009 when it received a new online image. In addition to the day’s new releases, The Daily website now also provides the most recently published analytical releases. From its humble beginnings in 1932 as a typewritten fact sheet, The Daily has evolved into a smart, fully electronic product that is delivered every workday morning at 8:30 (E.S.T. )—without fail—in English and French.